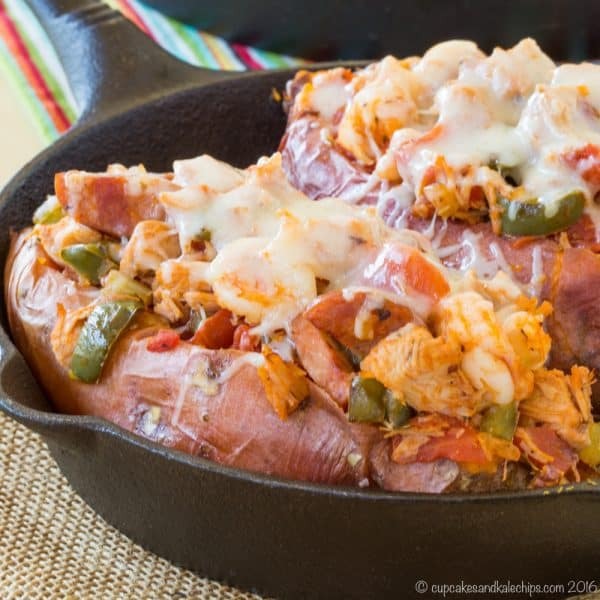 Jambalaya made with leftover turkey or chicken is stuffed into baked sweet potatoes for a delicious and hearty gluten free dinner. 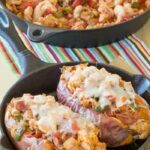 Stuffed baked sweet potatoes filled with a quick and easy version of jambalaya (minus the rice) is a fun twist on the smoky, spicy Cajun recipe. 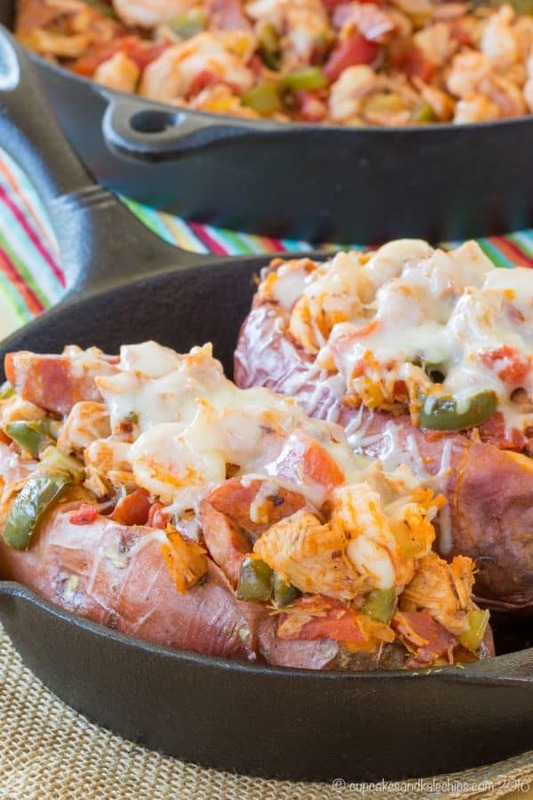 Whether you use a rotisserie chicken or leftover turkey from Thanksgiving, your family will love this simple dinner recipe of Jambalaya Stuffed Baked Sweet Potatoes. Disclaimer: I’m partnering with Tuttorosso to bring you this recipe. As always, all opinions are my own. We are going to have sixteen people around our Thanksgiving table. Sixteen! And most of them are arriving on Wednesday evening or Thursday morning and staying until Sunday. So we aren’t just talking about having to prepare a Thanksgiving feast for sixteen, we are talking about needing breakfast, lunch, dinner, snacks, and sweets to satisfy sixteen people for several days. And my family can eat. Thanksgiving leftovers will only get us so far. 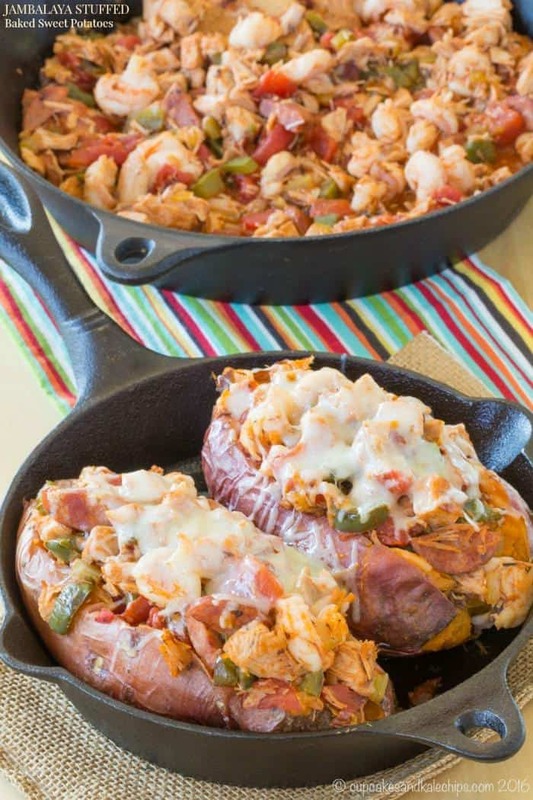 Jambalaya Stuffed Baked Sweet Potatoes are a delicious and nutritious way to reinvent your leftover Thanksgiving turkey, some cooked chicken breasts you might still have in the fridge, or even a rotisserie chicken you pick up from the store. 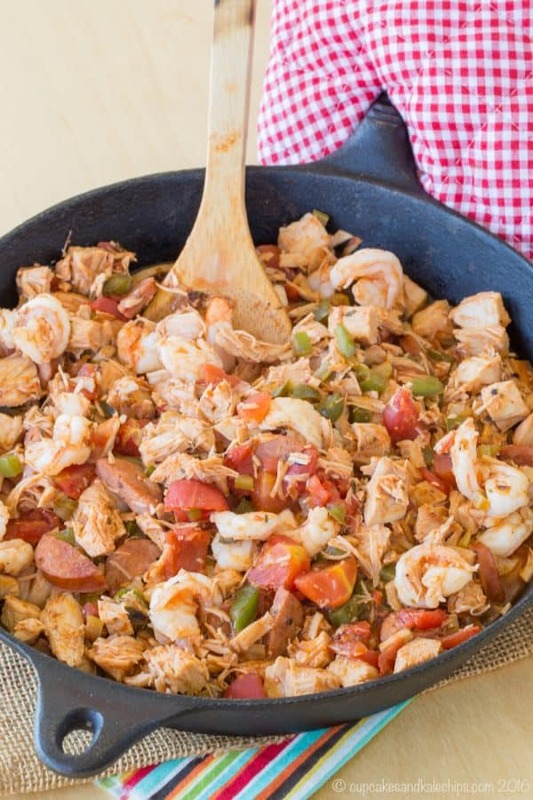 The jambalaya mixture is loosely based on the recipe for the traditional dish I found on Gimme Some Oven, and while it still has many of the essential elements of a good jambalaya, like peppers, sausage, and shrimp, I made a couple changes to make it come together super fast. First, instead of starting with raw chicken, I used leftover turkey, though of course chicken will work too, and, this will certainly upset the purists, I ditched the rice. 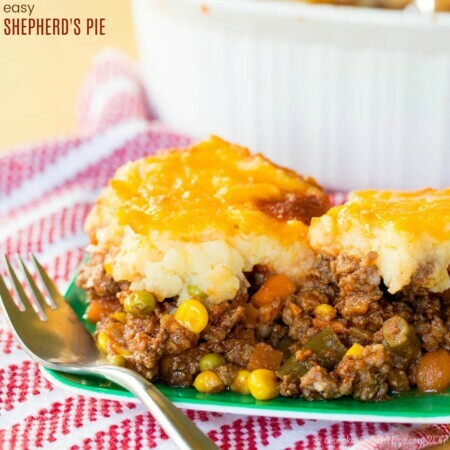 Instead, this kicked up stew was loaded inside some baked sweet potatoes for the super tasty combination of sweet and spicy that I am totally addicted to (Exhibit 1: Buffalo Chicken Shepherd’s Pie). You can totally enjoy it like this, which makes it an awesome grain free meal that, as long as you omit or substitute the Worcestershire sauce with a paleo-friendly replacement, can be a great paleo meal. 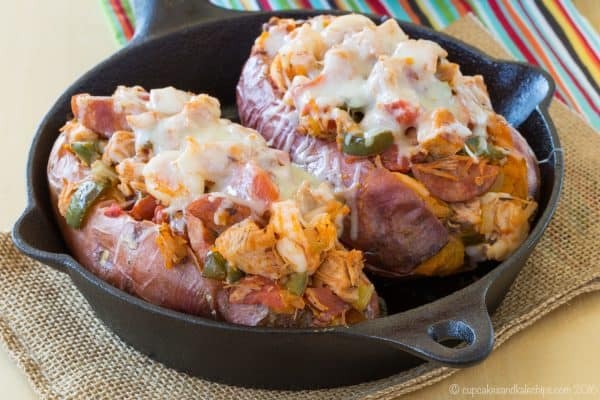 Or, as I am apt to do, you can totally add some cheese to these Jambalaya Stuffed Baked Sweet Potatoes, then pop them back into the oven to make the cheese all nice and melty. 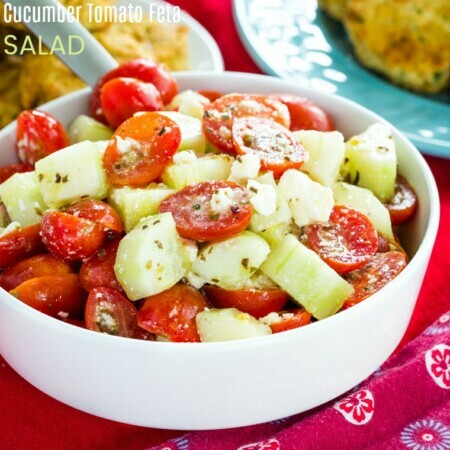 This meal was a hit with the whole family, though I did add a bit of plain Greek yogurt on top of the boys’ in order to tone down the spice a bit. So when you are buying everything for your holiday feast or grabbing that rotisserie chicken, make sure you pick up a can of Tuttorosso Diced Tomatoes. 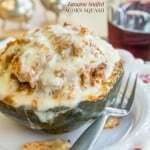 Way back in this Baked Spaghetti Squash with Spicy Sausage Tomato Cream Sauce recipe, one of my earliest blog posts, I mentioned that Tuttorosso has long been my choice for canned tomatoes. 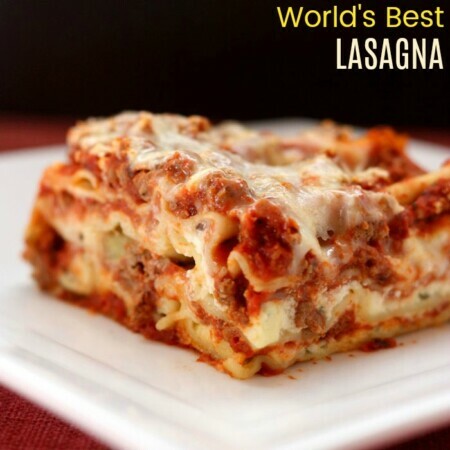 So I am thrilled to partner with them to create and share recipes featuring their products. And I am not alone in my love of Tuttorosso since they are the best-selling Italian inspired canned tomato product in America. The amazing flavor I love comes from the attention to quality by this family-owned company, as well as the special non-BPA can liners that lock in freshness. You can use the Store Locator to find Tuttorosso near you, or their products can also show up on your doorstep if you purchase from Amazon. 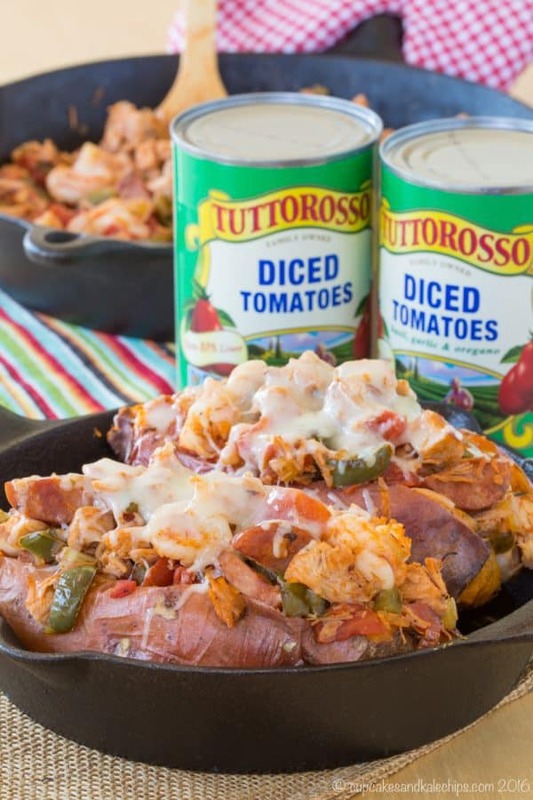 Learn more and get recipe ideas and inspiration by following Tuttorosso on Facebook, Twitter, Pinterest, and Instagram. 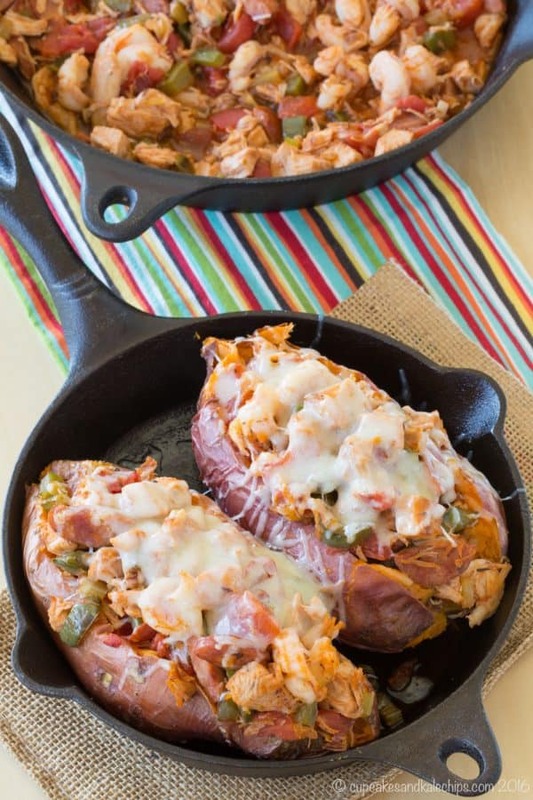 Now that looks tasty, but personally, I’ll take the cheesy option for these Jambalaya Stuffed Sweet Potatoes! Preheat oven to 400°F. Lightly coat sweet potatoes with olive oil and a sprinkling of salt, wrap in aluminum foil, and bake for 45-60 minutes, or until tender. Time will depend on the size of yor sweet potatoes. Alternatively, you can cook them in the microwave or slow cooker. Add celery, onion, bell peppers, and garlic and saute for about 5-7 minutes, stirring occasionally, until the vegetables are translucent and tender. Add the sausage and turkey, and continue cooking, stirring occasionally for an additional 5 minutes, or until the sausage is browned. Stir in the shrimp and continue to simmer, stirring occasionally, until the shrimp are pink and cooked through. Season to taste with salt and pepper and additional Cajun/Creole seasoning, if needed. Remove from heat. Remove the potatoes from the foil and place in a baking dish. Cut a slit down the middle of each one and open. 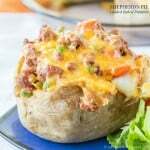 Fill each potato with Jambalaya mixture and, if using, top with about two tablespoons of cheese, or as much as desired. Return to the oven at 400°F for 5-10 minutes to heat through and melt the cheese. Jambalaya recipe adapted from Gimme Some Oven. Yum, this dinner looks amazing! We love jambalaya at my house, so going to have to try your recipe. Thank you for linking up with us at the #HomeMattersParty – hope to see you again this Friday! This sounds soooooo good! Such great flavors! Sounds like you’ll have a wonderful Thanksgiving with 16 people staying over! 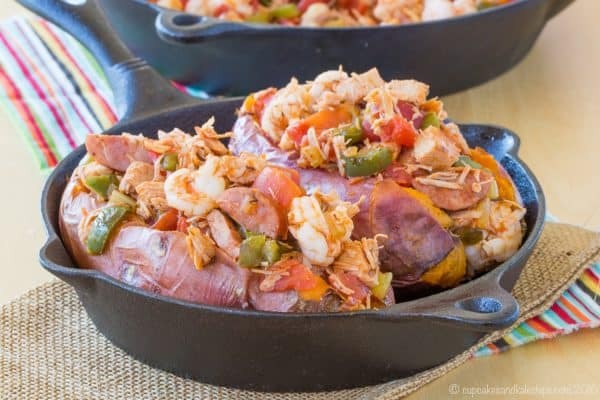 I seriously wish it was possible to reach through my computer screen a grab a couple of these jambalaya stuffed baked sweet potatoes! They look ahhmazing! What a great go to recipe to use any time of the year. 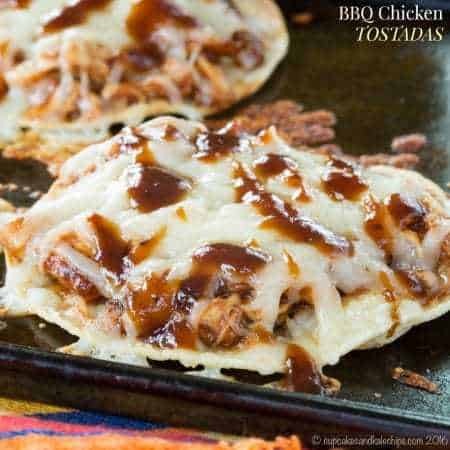 So easy and looks so delicious! This is such a brilliant idea!!! So much flavor! This. Is. GENIUS! 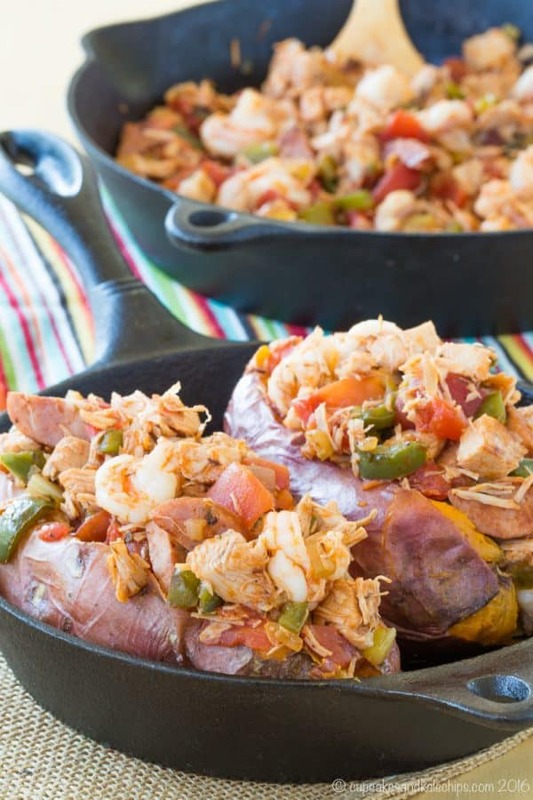 Absolutely love the idea of stuffing jambalaya into sweet potatoes! WOW! so much fabulousness in one dish! My family will love this! I love this dinner!! Looks delicious! We love stuffed sweet potatoes! I am all in for filling them with jambalaya! Yum!